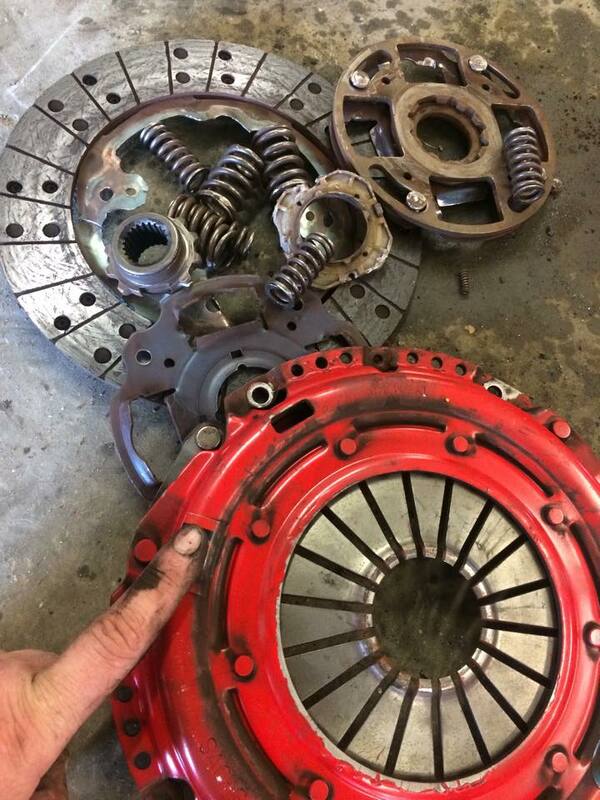 Dom’s Facebook post yesterday with the blown apart clutch is from my 2011 VW GTI … I was 300 miles from home, and 120 miles from Autobahn Service when it happened, and there was no question at all about where this work was getting done. I left Dom a message just before he opened on Tuesday morning, and within an hour had a tow truck coming to pick her up (shout out to Glen Hoff for the great service and seamless customer experience!). Dom had the new clutch on order as soon as the car arrived Tuesday afternoon, and helped me arrange to have a rental car ready and waiting at his shop before I got there to meet with him Wednesday morning. By Wednesday evening, he had the transmission dropped, the old clutch out, and pictures posted! The new clutch was installed and the car was ready and waiting for me by lunch time Thursday. I just picked her up, and she drives beautifully. I drove 575 miles round trip to have this service done by the best… and won’t hesitate to do again in the future! Dom – thanks, again, as always, for the outstanding customer service and unmatched workmanship and professionalism! Not that it isn’t always a pleasure, but I hope it’s a while before I have to come see you again. I wanted to send a quick note to say thanks and really great job on my Audi. It hasn’t driven as smoothly as the drive home in years — no idea what the previous guys did to it — but THANK YOU and wonderful job. I just wish you were a little closer to NYC. Over the past years you’ve and Autobahn Service have helped to keep my aging Accord alive and well, fixing various and sundry systems, including my brakes. For the second winter in a row the snow tires you installed have taken me places I wouldn’t have been able to get to before. Thank you for the great work and always top-notch customer service. Had an injector suddenly fail in the middle of 350 mile business trip. Dominic offered up one of his loaners so I wouldn’t miss my business, and went out of his way to have my car running perfectly again in time to ensure I wasn’t delayed getting home for the weekend. And all this despite an already loaded schedule, and having never done any work for me before. Not to mention the great communication with the shop during the service, and even a follow-up text message from Dominic to make sure she was still running smooth the next day, along with some pictures of the service. Too bad Autobahn is several hundred miles from my home, or they’d be my new go-to shop in a heart beat. I won’t hesitate to go out of my way to see them if I happen to need scheduled work in the future. Very highly recommended. Dominic is the best Audi mechanic the Berkshires ever had. These guys helped me out (gratis) one eve after hours when my gas tank door wouldn’t open, so I made it a point to go back when my VW had an electrical problem. How nice to find a friendly, efficient, trustworthy, high-quality shop (with no girlie calendars in sight!) Highly recommended! Dominic is second to none, especially when it comes to expertise on European cars. Autobahn Service is a full service shop and most definitely the best in Great Barrington. As a VW enthusiast, I was ecstatic to hear that the shop is an APR distributor. If you want both expert and quality service with a smile, make this your primary auto shop. Dominic and team were very helpful this New Year’s eve, diagnosing the problem quickly and ordering the part from the dealer for the afternoon’s delivery. Dominic was gracious enough to stick around and install a new coolant reservoir after nearly everyone else had gone home for the afternoon / holiday. He’s been in business for 10 years and his business’ growth is evidence of the personal touch he and the team provide to Autobahn’s customers. I’m not a local, but I’ll be back for work when I need it.